Box cameras have mechanically simple designs, the most common being a cardboard or plastic box containing a lens at one side and a film at the other. Lenses used in box cameras can either be single element designs with meniscus fixed focus lenses, or doublet lenses with minimal aperture or shutter speed adjustment. The latter offers better quality images than the former. Box cameras are best suited for brightly lit day surveillance, within the hyper focal distance of the lens and where there is little movement. This is because the box camera allows relatively lower possibility for focus adjustment, aperture adjustment, and has low sensitivity. With technological advancement, box cameras with shutter and aperture adjustment have been introduced which allows indoor surveillance as well. PTZ speed dome cameras are highly popular and the most preferred because they provide 360-degree rotation and 90-degree tilt, both optical and digital zoom, and a small, easy-to-mount casing. Domes with Alarm Inputs can be used in conjunction with External Movement Detectors to automatically pan, tilt and zoom the dome into an area where movement is detected, for instance, an entrance gate. 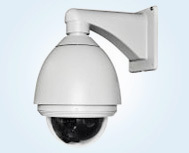 IR bullet cameras are the most commonly used security cameras; their shape is optimal for the adding the IR LEDs that enable day & night surveillance. Based on the number and strength of IR LEDs, the quality of the IR bullet cameras differ: a camera having powerful and higher number of IR LEDs will have a higher resolution with low or no light. 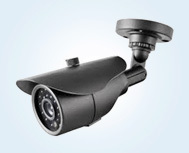 The features of the camera differ with each model, weatherproof bullet cameras can be used both indoor and outdoor. Bullet cameras can have simple fixed lens or high-end varifocal lens with sens-up, and WDR. IR dome camera is a metal ball style camera that offers a great choice for both indoor and outdoor, day-and-night CCTV surveillance. 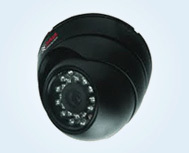 Some IR dome cameras also provide weatherproof and vandal resistant features. The resolution and the number of IR LEDs may vary with each model, and depending on the user�s requirements, the right combination can be selected. A digital video recorder (DVR) is an electronic device or application software that records videos in digital format to a mass storage device. DVRs find applications in several domains including security and surveillance. DVRs used for security record video signals from CCTV cameras and are feature-rich, offering several advantages over VCRs, which were previously used. Audio signals can also be recorded using DVRs. DVRs allow control over quality and frame rate and provide disk space optimization. Some DVRs allow remote access to footages using a computer, by connecting the DVR to the Internet. Security DVRs may be classified as PC-based or embedded. PC-based DVR consists of a classic PC containing video capture cards that captures video images. Embedded DVRs are specially designed DVRs with an operating system. Either a firmware of a read-only memory contains the application software. DVRs when used for security and surveillance in vehicles are referred to as �Mobile DVRs�. Be it a passenger bus, or a school bus, or even a personal vehicle, mobile DVRs help drivers to focus on the traffic and the activities inside the vehicle simultaneously. Mobile DVRs have anti-vibration features to protect the device from the movements of the vehicle and bumpy roads, etc. to ensure video quality. Mobile DVRs often have additional features such as GPS that are required specifically for vehicles. Network video recorders (NVRs) are software programs used to record video signals in digital format to a mass storage device. An NVR does not have a dedicated video capture hardware device; however, the software is generally run on a dedicated device with an embedded operating system. NVRs are used in IP (Internet Protocol) video surveillance systems, and they even allow access to footages through web browsers. Some NVRs also have features to provide notifications through emails in case an alarm is triggered. TVL (Television Lines) refers to the horizontal resolution of a CCTV camera, i.e., the maximum number of vertical lines (alternating dark and white) a camera can resolve per picture height. TVL is one of the most important measures of resolution of a video system and is an inherent quality of the camera. 480 TVL therefore means that 240 dark and 240 white vertical lines can be resolved over a horizontal span that is equal to the picture height. 520 TVL would mean that 260 dark and 260 white vertical lines could be resolved over a horizontal span that is equal to the picture height. 600 TVL would mean that 300 dark and 300 white vertical lines could be resolved over a horizontal span that is equal to the picture height. Lens is the most important part of any camera; it transmits and refracts light and allows you to capture a photograph or a video. The most critical parameters of a lens are its focal length and aperture. Focal length is the degree to which the lens converges or diverges light. It determines the magnification of an image. It is measured in millimeters (mm). Aperture is the opening through which light travels. It determines the light intensity of an image. It is usually represented in f-number. IR lenses have the same principle as common optic lenses, except for the fact that an IR lens allows light in the infrared (IR) region (including near infrared, short-wave infrared, mid-wave infrared and long-wave infrared) to pass through the lens, instead of visible light. IR lens is advantageous because it allows for nighttime image or video capturing, which is not possible with conventional lens. IR lenses are made of special materials that allow IR light to pass through. 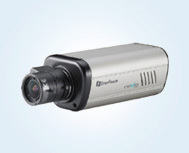 IR cameras have IR LEDs around the IR lenses, which illuminate an area with infrared light. The number of IR LEDs determines the quality of the image or the video. Motion detection is a special feature in which, a sensor scans for any disturbance in the surroundings, and if any disturbance or movement is detected, the camera is triggered to capture a video of the disturbance. On-Screen Display (OSD) is an image that is superimposed on the screen image, which displays settings information such as menu, volume, time, date, etc. OSD control provides you the control over such OSD settings. EFFIO (Enhanced Features and Fine Image Processor) is a signal processor that produces high-resolution video with high signal-to-noise ratio and high color in surveillance cameras. EFFIO-P has 700 TVL; 960 H WDR CCD and a lot more functions. It realizes high quality videos with high reliability. Zooming is a feature offered by an assembly of lens that allows the focal length to be changed, which is not possible in a fixed length lens. The zoom feature allows you to focus on a particular region of an image or a video and to magnify it so that it can be examined more clearly. Zooming is particularly important for surveillance. Pan-Tilt-Zoom (PTZ) is a feature that specifies the movement options (pan, tilt and zoom) of a camera.